So, I'm walking down the street in Washington, D.C. and noticed a new souvenir store. Some people might think - All souvenir shops have the same stuff. Not true, I've found. Inside, most of the items were the typical souvenir stock: T-shirts, mugs, snow globes. However, almost lost in a display case was a small ceramic building which I could not identify. I asked to see it and it turned out to be a miniature of Number One Observatory Circle. While not as famous as another address in D.C., this is the official residence of the Vice President. The best part about this souvenir building was reviled when I turned it over. On the bottom is hand written, "June 21st 1983. To Sue Block - With great friendship and love - Barbara Bush." Yeah, that Barbara Bush - former First Lady of the United States. 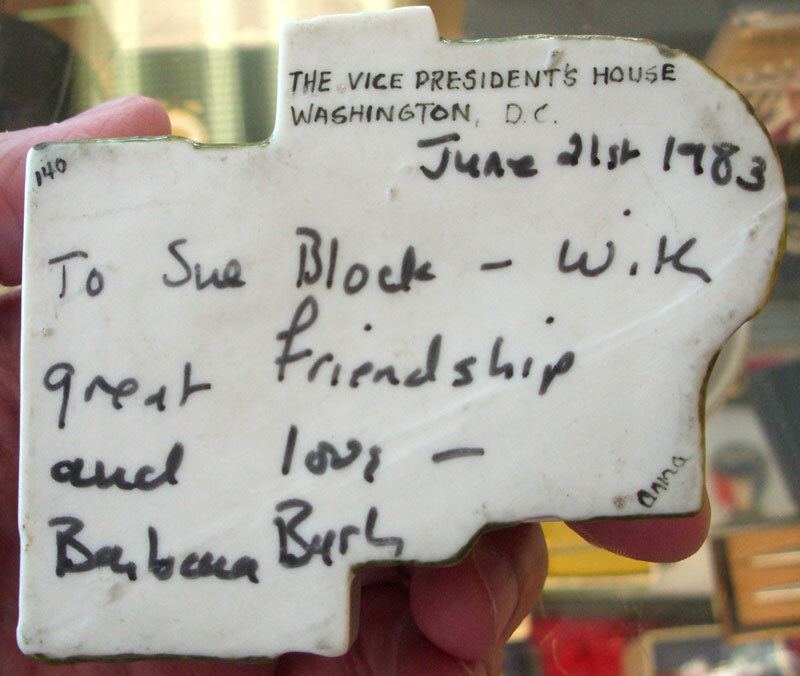 Also on the bottom, perhaps written by the person who hand painted the colorful house, is "The Vice President's House Washington, D.C. 140 Anna." 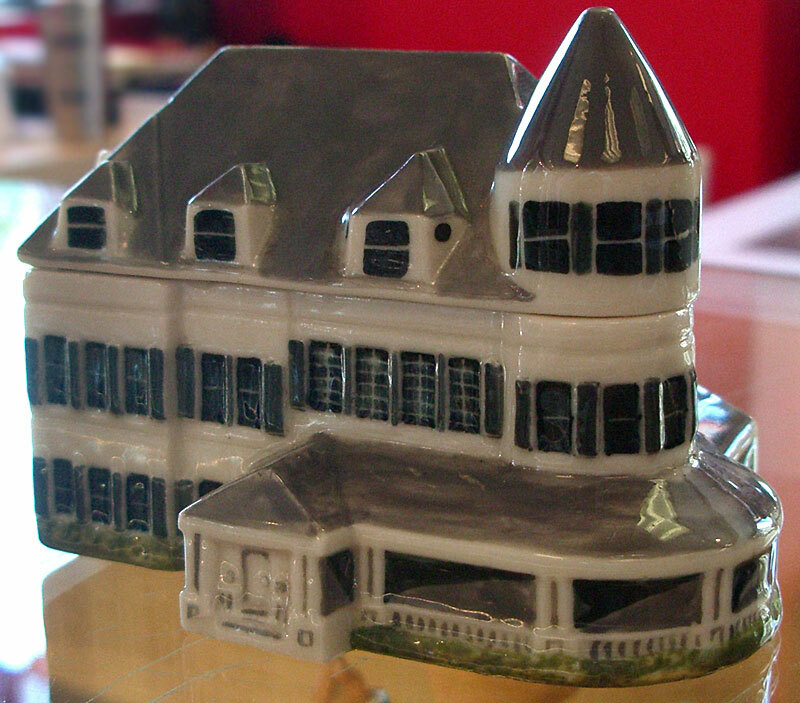 The roof comes off of the porcelain trinket box which stands about two to three inches tall. The bottom of the roof is marked with Hurley Porcelain's mark and 1981. Looks like Herley made a series of historic homes in miniature, but I was unable to find much information about the company. The only thing I didn't like about this mini replica was the price. When I first glanced at the tag, I thought it read read $39, which was not bad. Then, I looked again and realized it actually read $395. Wow. Thats a lot for a ceramic building, but I'm sure most of the value is in the signature. Located on the grounds of the United States Naval Observatory, the white 19th Century house at Number One Observatory Circle in northwestern Washington, D.C., was built in 1893. Originally intended for the superintendent of the USNO, the house was so impressive that the chief of naval operations kicked out the superintendent so he could move in himself in 1923. Historically, Vice Presidents and their families lived in their own homes, but the cost of securing these private residences grew substantially over the years. Finally, in 1974, Congress agreed to refurbish the house at the Naval Observatory as a home for the Vice President. Three years passed before any Vice President actually lived at Number One Observatory Circle. Vice President Gerald Ford acceded to the Presidency before he could use the home and his Vice President, Nelson Rockefeller, only used it for entertaining. Walter Mondale was the first Vice President to move into the home. It has since been home to the families of Vice Presidents Bush, Quayle, Gore, and Cheney. Vice President and Dr. Biden currently reside there. The house is built in the Queen Anne style popular in the last quarter of the nineteenth century. Hallmarks of the Queen Anne style are an asymmetrical floor plan, a series of rooms opening to each other rather than a common central hall, round turret rooms, inglenooks near fireplaces, and broad verandas wrapping the ground floor, all of which are found at Number One Observatory Circle. Did you buy it Dave? No, I didn't buy it - too pricey for this one. Hey Dave - I have this (without Babs personal greeting) in my collection of "ceramish" buildings. You know I certainly did not pay anything near that amount.